An arms factory in southeast England was occupied by activists on Tuesday morning in protest against its sales to Israel and Afghanistan. Protesters say the company is complicit in “Gaza’s misery,” where 2,137 Palestinians were killed last summer. Instro Precision Ltd in Kent was besieged by activists at 5am on Tuesday, who occupied and shut down the factory. Taking to the roof, campaigners unfurled a banner demanding Instro “stop arming Israel.” Four protesters remained on the building’s roof, while 10 stood at ground level. The firm manufactures high-tech camera systems used in drones that have been deployed in Israel and Afghanistan. Located near the coastal town of Broadstairs, Kent, it is a subsidiary of Israeli arms company Elbit Systems. Elbit’s drones have been deployed by the Israel Defense Force (IDF) to kill countless Palestinian civilians in Gaza, according to UK think tank Campaign Against the Arms Trade (CAAT). The think tank adds the camera technology is used in Israel’s “apartheid wall,” and in drones flown across Afghanistan. Elbit’s share price soared during Israel’s military assault on Gaza last summer, where armed Israeli drones are estimated to have killed as many as 830 Palestinians. Despite the bloodshed its products have wrought, the arms giant’s business continues to boom. According to CAAT, it’s currently making its way through a $6.2-billion backlog of orders. UK campaign group London Palestine Action said Instro was shut down on Tuesday because the British government sold “£500,000 [worth] of weapons” to Israel during the state’s military bombardment of Gaza last summer. Campaigners were joined by local Green Party candidate for Thanet, Ian Driver, who offered his support for the action. Electronics deployed by Instro’s parent company, Elbit Systems, are regularly used in Israel’s 700-kilometer wall, which snakes across the West Bank. Palestinians say the wall is an instrument of apartheid that separates civilians from their families, farmers from their land, and is used to annex Palestinian territory for illegal Israeli settlements. The Israeli government argues the barrier protects its civilians from Palestinian aggression, including suicide bomb attacks. Elbit Systems is the world’s leading drone manufacturer, and produces 85 percent of the IDF’s unmanned aerial vehicles (UAVs). The arms giant was described by IDF officials as a “real asset” during Israel’s 2014 bombing of the Gaza Strip. No arrests have been made at Instro Precision Ltd's site in Kent. A spokesman for Kent Police told RT the force is currently monitoring the demonstration to ensure it remains peaceful and within the law. Officers are also observing how events unfold to protect public safety and minimize disruption, he said. Instro’s website says the factory employs over 70 people at its Kent-based site. RT called the Elbit subsidiary to inquire about its alleged sale of of military wares to Israel during the 2014 Gaza conflict. No one was available to answer the call. Tuesday’s action marks the second time a UK-based Elbit arms factory has been targeted by activists in recent months. 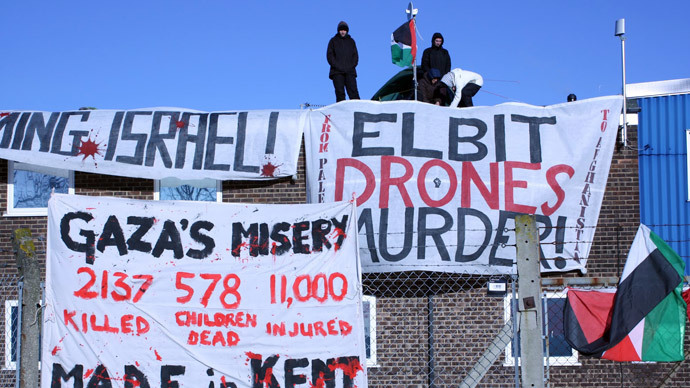 In August 2014, a drone engine factory was occupied by a large group of pro-Palestinian campaigners, and also shut down for a day. Palestinian civil society has called upon governments across the globe to impose an arms embargo on the Israeli government, and to cease buying military wares from Israeli firms such as Elbit. Abdulrahman Abunahel, of Palestine’s Boycott, Divestment and Sanctions (BDS) movement, said the campaign is calling on states worldwide to play their part in preventing further massacres of Palestinians, and to cease trading arms with Israel. Nevertheless, Britain’s arms trade with Israel continues to thrive. The UK exported £7 million worth of military wares to Israel in the six months leading up to the 2014 Gaza conflict, including drone components, according to CAAT. Rida Abu Zneid, a young Gazan who witnessed her sister being blown apart by a missile from an Israeli drone, said if arms companies considered for a second the brutal impact their deadly weapons have on humanity they would stop producing them. She told Corporate Watch a single day living in Gaza would provide valuable insight.